Rezaei, A., Delavar, A., Akbari Balootbangan, A., Mohammady Far, M. (2016). Simple and Multiple Correlations of Motivational Strategies with Academic Performance of English Language. International Journal of Behavioral Sciences, 10(2), 112-116. Ali Mohammad Rezaei; Ali Delavar; Afzal -- Akbari Balootbangan; Mohammad ali Mohammady Far. "Simple and Multiple Correlations of Motivational Strategies with Academic Performance of English Language". International Journal of Behavioral Sciences, 10, 2, 2016, 112-116. Rezaei, A., Delavar, A., Akbari Balootbangan, A., Mohammady Far, M. (2016). 'Simple and Multiple Correlations of Motivational Strategies with Academic Performance of English Language', International Journal of Behavioral Sciences, 10(2), pp. 112-116. Rezaei, A., Delavar, A., Akbari Balootbangan, A., Mohammady Far, M. Simple and Multiple Correlations of Motivational Strategies with Academic Performance of English Language. International Journal of Behavioral Sciences, 2016; 10(2): 112-116. Abstract Introduction:The aim of present study was the investigation of simple and multiple correlations of motivational strategies (self-efficacy, achievement goals and test anxiety) with English language academic performance. Methods:For this purpose, 296 pre university students (139 girls and 157 boys) were selected by clustery random sampling and motivational strategies and achievement goals answered by selected sample. For analyzing of data Pearson correlation and multiple regression analysis were run.Results: The results showed variables namely, self-efficacy, mastery-oriented achievement goals, were correlated with English language scores, positively; and variable namely: test anxiety, and avoidance of performance were correlated with English language scores, negatively. Also, there isn’t significant correlation between avoidance of mastery and English language academic performance. The result of multiple regression analysis indicated that 26% of variance of English language score explained by self-efficacy, mastery achievement goals and test anxiety. Conclusion: Ultimately, it can be said, self-efficacy, mastery achievement goals and test anxiety are more effective variables on English language academic performance and they can improve the scores of English language. Chamorro-Premuzic T, Furnham A. Personality traits and academic exam performance. European Journal of Personality. 2003;17(2):237-50. Aboighasemi A, Javanmiri L. The role of social desiability, mental health and self-efficacy in predicting academic achievement of female students. Journal of School Psychology. 2012;1(2):6-20. Kareshki H, Bahmanabadi S, Balochzade F. Determining the Role of Achievement Objectives in Mediating the Relationship between Classroom Assessment Structure and Academic Achievement: A Descriptive Study. Iranian Journal of Medical Education. 2013;13(2):123-33. 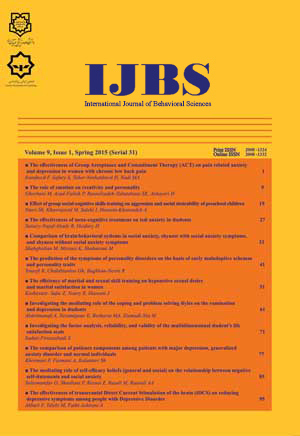 Gholami Y, Khodapanahi M, Rahiminejad A, M. H. The relationship between achievement motivation, self-concept and performance in science in eighth graders: a study based on analysis of results of TIMSS - R. Journal of Iranian Psychologists. 2007;2(7):207-18. LKY L. A Study of the Attitude, Self-efficacy, Effort and Academic Achievement of City U Students towards Research Methods and Statistics. Discovery â SS Student E-Journal. 2012;1(54):154-83. Gholamali Lavasani M, Hajazi A, Khazariazar H. The role of self-efficacy, task value, achievement goals and cognitive engagement in mathematics achievement test causal models. Journal of Educational Innovation. 2012;11(41):7-28. Schater D. Psychology United States of America: Catherine Woods. P, ISBN 13: 978-1-4292-3719-2, editor2011. Maltby F, Gage NL, Berliner DC. Educational psychology: an Australian and New Zealand perspective: Brisbane: Wiley; 1995. Stipek DJ. Motivation to learn: From theory to practice (4th ed). Boston, Allyn & Bacon; 2002. Pintrich PR, De Groot E. Motivational and self-regulated learning component of classroom academic performance. Journal of Educational Psychology. 1990;82(2):33-40. Liem AD, Lau S, Nie Y. The role of self-efficacy, task value, and achievement goals in predicting learning strategies, task disengagement, peer relationship, and achievement Outcome. Contemporary educational psychology. 2008;33(3):486-512. Kaplan A, Maehr ML. The contributions and prospects of goal orientation theory. Educational Psychology Review. 2007;19(2):141-84. Elliot AJ, McGregor HA. A 2 X 2 achievement goal framework. Journal of Personality and Social Psychology. 2001;80(3):501-19. Harackiewicz JM, Barron KE, Pintrich PR, Elliot AJ, Thrash TM. Revision of achievement goal theory: Necessary and illuminating. Journal of Educational Psychology. 2002;94(3):638-345. Matos L, Lens W & Vansteenklste M. Achievement goals, learning strategies and language achievemen among peruvlan high school students. http;//wwwvopspsyugentbe/pdfs/download Pup? own=mvsteenk & file. 2005. Pirkamali MA, Momeni Mahmoei H & Pakdaman M. Review of the relationship between self-efficacy of science teachers on motivation, attitude and academic achievement of fifth grade elementary school students. Research in Curriculum Planning. 2013;10(10):123-35. Erlanger A, Turner M & Chandler RW. The Influence of Parenting Styles, Achievement Motivation, and Self-Efficacy on Academic Performance in College Students. Journal of College Student Development. 2009;50(3):337-46. Sepehrian Azar F. Self-efficacy, achievement motivation and academic procrastination as predictors of academic achievement in pre-college students. Proceeding of the Global Summit on Education. 2013;25(2):173-8. Green BA, Miller RB, Crowson M, Duke BL, Akey KL. Predicting high school student's cognitive engagement and achievement: Contribution of classroom perception and motivation contemporary. Educational Psychology. 2004;29(4):462-82. Yusuf M. The impact of self-efficacy, achievement motivation, and self-regulated learning strategies on studentsâ academic achievement. Social and Behavioral Sciences. 2011;15(3):2623-6. Karami AA, Amir Teimori MH. Effectiveness cognitive and Meta cognitive strategies training on test anxiety and self-esteem third son Shasta Jerusalem. Quarterly Journal of New Thoughts on Education. 2013;9(2):85-107. Lashkaripour K, Bakhshani N, Solaimani M. The relationship between test anxiety and academic achievement in students of guidance schools in Zahedan in 2006. Tabib Shargh Journal. 2007;5(4):253-9. Mandler G, Sarason SB. The original research and development of the TAQ (Test Anxiety Questionnaire) was conducted by a study of anxiety and learning. Journal of Abnormal and Social Psychology. 1952;47(3):166-73. Zeidner M. Test anxiety: the state of the art. New York: Plenum; 1998. Mahdavi ghoravi M, Khosravi M, Najafi M. Predicting academic achievement through test anxiety, perfectionism, and achievement motivation. Quarterly journal of new thoughts on education. 2011;8(3):31-50. Mavroveli S, Sanchez-Ruiz MJ. Trait emotional intelligence influences on academic achievement and school behavior. British Journal Education Psychology. 2011;81(1):112-34. Mousavi S, Jabalameli J, Alibakhshi F. Study of the relation emotional intelligence (EI) and, motivation beliefs self-regulatory on the academic performance. Journal of Behavioral Sciences Research. 2012;10(3):179-92. Khormaei F, Khayer M. Goal-oriented search interface and student approach to learning. Academic psychology Journal. 2008;2(7):123-38. Li L. A Study of the Attitude, Self-efficacy, Effort and Academic Achievement of City U Students towards Research Methods and Statistics. DiscoveryâSS Student E-Journal. 2012;1(54):154-83. Elahi Motlagh S, Amrai K, Yazdani MJ, Altaib Abderahim H, Souri S. The relationship between self-efficacy and academic achievement in high school students. . Social and Behavioral Sciences. 2011;15(2):765-8. Diseth A. Self-efficacy, goal orientations and learning strategies a mediators between preceding and subsequent academic achievement. . Learning and Individual Differences. 2011;21(2):191-5. Stankov L, Lee J, Luo W, Hogan DJ. Confidence: A better predictor of academic achievement than Self- efficacy, Self-concept and anxiety? Original Research Article. Learning and Individual Differences. 2012;22(6):747-58. Church MA, Elliot AJ, Gable SL. Perception of classroom environment achievement goals, and achievement outcomes. Journal of educational psychology. 2001;93(1):43-54. Pintrich PR. An achievement goal theory perspective on issues in motivation terminology, theory, and research. Contemporary educational psychology. 2000;25(3):92-104. Mc Whaw K, Abrami PR. Student goal orientation and interest: Effects on student use of self-regulated learning strategies. Contemporary educational psychology. 2001;26(3):311-29. Elliot AJ, Church MA. A hierarchical model of approach and avoidance achievement motivation. Journal of personality and social psychology. 1997;72(1):218-33. Rastegar A, Ghorban Jahromi R, Salim Haghighi A, Akbari AR. The relation of epistemological beliefs and mathematics achievement: the mediating role of achievement goals, mathematics self-efficacy, and cognitive engagement. Social and Behavioral Sciences. 2010;5(3):791-7. Rostami M, Hejazi E, Gholamali Lavasani M. The relationship between gender, perception of classroom structure, achievement goals, perceived instrumentality and academic achievement in English course third grad middle school students (English as second language). Social and Behavioral Sciences. 2011;29(703-712). Dweck CS, Leggett EL. A social-cognitive approach to motivation and personality. Psychological Review. 1988;95(3):256-73. Pekrun R, Elliot AJ, Markus AM. Achievement Goals and Achievement Emotions: Testing a Model of Their Joint Relations With Academic Performance. Journal of Educational Psychology. 2009;101(1):115-35. Kaplan A, Flum H. Achievement goal orientations and identity formation styles. Educational Research Review. 2010;5(3):50-67. Shu-shen S. Role of achievement goals in childrenâs learning in Taiwan. Journal of educational psychology. 2004;72(2):310-8.